The Duke of York [Prince Andrew] is also said to have played a behind-the-scenes role in encouraging the terrorist’s release. Even the fellow panel members on the mostly liberal MSNBC seemed shocked. Guest Sam Stein of the left-wing Huffington Post recoiled, "Really? To call her bigoted?" Mitchell repeated her charge: "Well, she was decrying immigration and in a lot of people's views, that is a bigoted stand." Fill-in host Savannah Guthrie didn't seem to agree, asserting that this wasn't something you do "when you're trying to reach out to the working class." If Joe Scarborough is right, this could be a game-changing blow to Barack Obama . . .
On today's Morning Joe, Scarborough left no doubt that he believes the Obama administration acquiesced to the release by the British government of Abdelbaset Al Megrahi, the convicted Lockerbie murderer and terrorist. Scarborough was reacting to reports suggesting that, contrary to initial claims, the release was done at the behest of Gordon Brown's British government, and was not an independent move by Scotland. 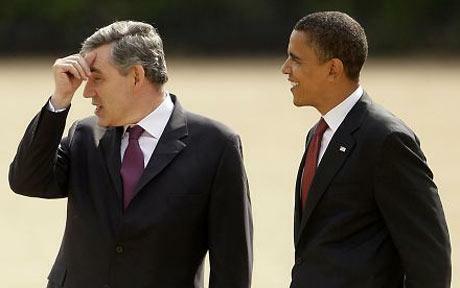 Is British Prime Minister Gordon Brown also an Obama lover? Most of you have probably seen or heard the "viral video" of the British MEP, Daniel Hannan, eviscerating the socialist economic polices of Prime Minister Gordon Brown in the European Parliament. If you did, you probably became aware of the video on either the Web, talk radio shows such as Rush Limbaugh, or on a very few cable TV programs. The reason is that the MSM mostly ignored this scintillating attack upon the disastrous economic effects of socialism as represented by Brown which could well be extended to our own president, Barack Obama. If the snub of British PM Gordon Brown at the hands of President Obama and his wife weren't enough, now British Cabinet Secretary Sir Gus O'Donnell is saying that Downing Street is finding it "unbelievably difficult" to get hold of officials from Obama's administration. British officials can't seem to ever get past the administration's answer machines as they call here to try and coordinate plans for the coming G20 summit. In frustration O'Donnell said that that when he tries to get in touch with key members of Obama's Treasury Department "there is nobody there." The phones ring and nobody answers or they get messages and that is all. "You cannot believe how difficult it is," O'Donnell told participants at a civil service conference. While the Obama Administration ducks the Brit's phone calls, the U.S. media also seems to be ignoring this story as they've widely ignored several of the stories that detail the new administration's offhanded treatment of our closest ally. The Obamas, Barack and Michelle both, pretty much diplomatically botched the recent visit of British Prime Minister Gordon Brown and his wife. Oddly enough, the U.S. Old Media seems uninterested in the story that is a hot topic in England, a story that's left many Brits a bit miffed. As the visit of the national leader of our closest ally began, the President informed the Brits that he wouldn't be attending the joint press conference that was planned to be held once PM Brown's plane touched down. This threw the visiting delegation into a tizzy leaving them scrambling to explain the sudden change in plans to the folks back home. Still, meetings were had and things smoothed out. Eventually the visit seemed to right itself... then came the Obama's gift gaffes. As part of a continuation of his "COMЯADE UPDATE" segment he started near the beginning of his show, which became a YouTube sensation, Fox News host Glenn Beck is picking up right where he left off. Beck, on his March 4 program took on a couple new targets, UK Prime Minister Gordon Brown and union labor. "Comrades! Comrades, there is good news from the Western front," Beck said. "Our glorious revolution is starting to take hold on a global scale. Just listen as Comrade Brown pounded our propaganda into the minds of the clueless capitalist pigs today. Listen up." Beck played a clip from Brown's address of a joint session of Congress, where the prime minister lobbied for the "world" to work together. British journalists are nonplussed, to say the least, that President Obama didn't schedule a full press conference for today's White House visit by Prime Minister Gordon Brown. 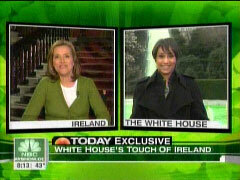 Though there was never any announcement on this side of the Atlantic that there would be a full-blown joint news conference today when British Prime Minister Gordon Brown stops by to meet with President Obama, some British journalists are rather cranky this morning about the fact that there won't be one. Some who flew over with Brown last night thought there would be an Obama-Brown newser, and were surprised to hear when they arrived that there wouldn't. They see it as a snub. "Embarrassing," says Benedict Brogan of The Mail. Embarrassing, that is, for Brown. "Mr Brown might lament," writes Toby Harnden of The Telegraph, "that despite the so-called 'special relationship' Britain is now getting the same treatment as the president of Uruguay but he need not despair. I'm told there's a chance he might get drinks with Vice President Joe Biden on Tuesday evening." LONDON, Nov. 10 -- Prime Minister Gordon Brown on Monday warned that trade protectionism would worsen the global financial crisis, a remark widely perceived as aimed at U.S. President-elect Barack Obama. In a speech lauding the "global power of nations working together," Brown called for "rejection of beggar-thy-neighbor protectionism that has been a feature in transforming past crises into deep recessions." Obama's campaign rhetoric struck some allies as protectionist, particularly his calls for tax incentives to discourage companies from relocating jobs away from the United States.